The first time Jim Serpa came face-to-face with a shark, it was not under ideal circumstances. Serpa, a San Clemente resident and former supervising ranger at Doheny State Beach, was diving with friends in the Bahamas. He was 60 feet deep in the water when a friend handed him a large conch shell, which was harboring an unseen hermit crab. The crab reached out and cut Serpa’s finger, drawing blood. What came next sounds like a scene out of Jaws, only with a happy ending. A large bull shark was nearby and could sense the blood in the water. It decided to glide in for a closer look. Serpa knew he was in trouble, but once the shark came within four feet of him, he could tell it was not being aggressive. After a few nervous seconds, when man and shark sized each other up, the shark swam off. It was a moment Serpa said he will never forget and it sparked a years-long fascination with the animal. His interaction with that shark in the Bahamas caused Serpa to dive headfirst into the world of sharks. He majored in environmental geography and minored in zoology while in college, and had access to observe sharks in the area for years while working at Torrey Pines State Beach and Doheny. After taking countless courses and logging hours in the field, he has become a respected figure in the shark community. On July 30, nearly 200 people attended one of Serpa’s famous campfire talks at Doheny State Beach. It was standing room only as people gathered around the self-described “educated shark nerd,” hoping to glean some new information about the popular creatures. Serpa, who is retired after serving as a ranger at Doheny for 23 years, is well-versed on many things. He gives talks about Native Americans, native plants, whales and dolphins. But it’s his shark lectures that always draw the biggest crowds. The fascination with sharks has been in the public’s conscience since the dawn of modern pop culture. The fin poking above water, the grace with which they move and their physical appearance all make for ideal Hollywood imagery. From Jaws to the Discovery Channel’s popular Shark Week programming, sharks hold a distinct place in our minds when we think about the ocean and the creatures that inhabit it. While some may find sharks intriguing, there are others that are downright terrified of them—and for good reason. As the ocean temperature began to rise over the past three months, several sharks have been spotted in the area. There was also one gruesome attack off the shore in Corona del Mar in May, when a woman was bit by what is believed to be a great white. A humpback whale that died at sea and drifted down the coastline last month also drew in several large white sharks that were feeding on the carcass, which Serpa saw firsthand while on a boat. Serpa preaches caution during his lectures, hammering home the fact that sharks are wild animals and that swimming alone outside of the surf zone is not a good idea. Being around schools of seals out in the open water is also not advised. But, he does not want people to be afraid of going into the water. The title of Serpa’s shark lecture is The Myth of the Monster, and one of his main goals is to dispel the belief that all sharks mean to harm anyone that treads into the water. Decades ago people were convinced that most sharks were vicious man-eaters, Serpa said. But as more scientific research about the animals was conducted, the paradigm began to shift. The craze that came along with Discovery Channel’s Shark Week programs helped to show sharks in a different light, Serpa said. While some shows occasionally have the gratuitous scene where a shark hunts a seal or another animal in the water, many of the shows now feature interesting alternate angles, like migratory patterns or unique behavior. Serpa and his friends used to call each other after Shark Week shows aired and laugh about what the show got wrong. The public’s newfound appreciation for sharks, coupled with actually getting facts straight, has made Shark Week viewing much more enjoyable for Serpa these days. Serpa tries to condense his knowledge down into a short presentation for shark fans young and old. He brings his fossil collection to his lectures so people can get a better grasp on just how big, or small, some sharks can be. He has placards with multiple shark teeth glued onto them, labeled so people can see the difference between a leopard shark’s tooth and a thresher shark’s tooth. Both are species that roam in the waters nearby. His career as a parks ranger may be over, but Serpa is still an avid observer of nature. He treks down to the ocean frequently, and stays in touch with his former colleagues, who key him in on interesting sightings they come across on the water. 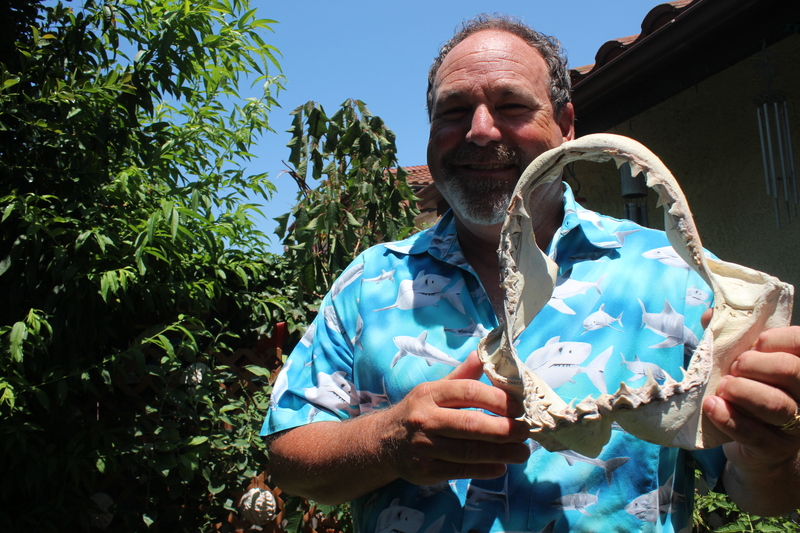 He normally gives four campfire talks a year, and is planning on holding one of his campfire shark talks at San Clemente State Beach later this summer.